Twin Farms, an all-inclusive luxury inn in Barnard, Vt., features a yoga deck. September is National Yoga Month, and whether you’re a seasoned yogi or a total newbie, we’ve found stunning spots in New England — from yoga retreats to seaside resorts that offer yoga classes — where folks of all levels can get their downward dog on. Spread over a stunning 150-acre swath in the Berkshires, Kripalu Center for Yoga & Health is a hub of holistic health and a go-to resort for all yogis. If you’re looking for guidance, specific education and a structured schedule, sign up for one of their themed programs — there are hundreds throughout the year. For example, you might enroll in “Quiet Your Inner Critic and Calm Your Anxious Mind” Sept. 21-23, “Five Days to Get Om Schooled: A Fall Yoga Immersion,” Sept. 17-21, or “Painting and Yoga in the Berkshires” Sept. 30-Oct. 5. Or, if you’re just looking to unwind and do your own thing, there’s the make-it-want-you-want “Kripalu R&R” option. Here you might take a gentle yoga class — or not. Just sit back and enjoy the view. Or practice solo by the lakefront beach, curl up with a book, sketch, take a guided group hike, or walk alone. Stay as long as you want. 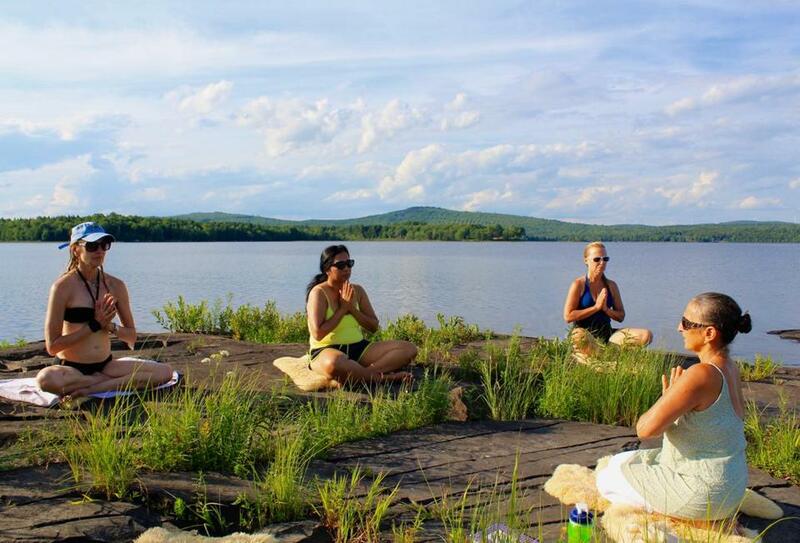 At Sewall House Yoga Retreat in Island Falls, Maine, classes are small and other outdoor activities are available. If you’re really just looking to get your child’s pose on before relaxing with wine on vacay, we’ve got you. 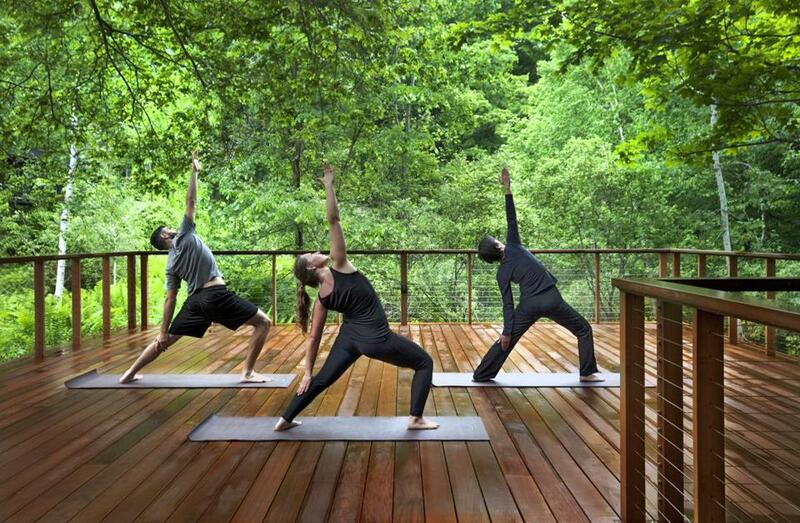 Greet the morning on the yoga deck at Twin Farms, an all-inclusive luxury inn in Barnard, Vt. Surrounded by Vermont-in-a-postcard woods, trails, and pond. Take a meditation class, practice yoga in the fitness center, soak in a traditional Japanese furo tub — a hot soaking pool with woodland view, or head to the spa for a heated blue stone massage. Hike or bike on-site trails, or just curl up by the fireplace with a book and glass of wine. Farm-to-table meals are included in the room rate, as is wine, beer, and spirits. Rates vary. 452 Royalton Turnpike, Barnard, Vt. 802-234-9999. www.twinfarms.com/spa. 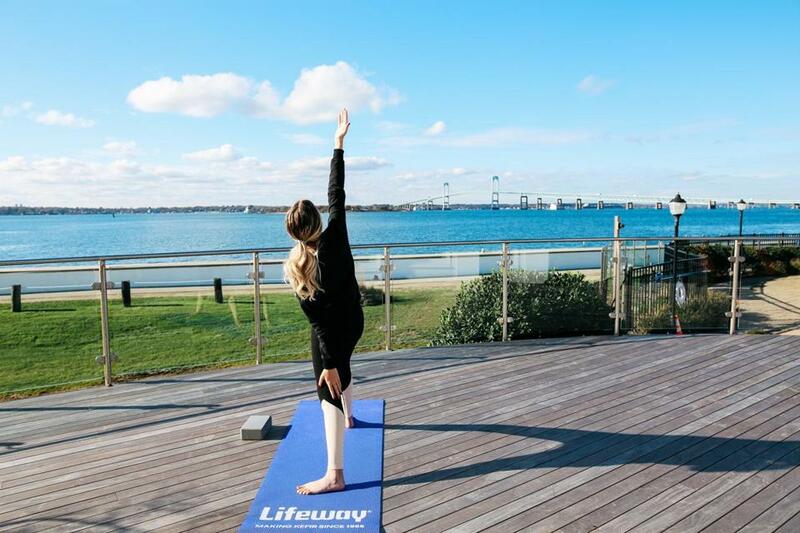 At Gurney’s Newport Resort & Marina on Goat Island in Newport, R.I., guests enjoy complimentary weekend yoga overlooking Newport harbor.